Week #3 GEHMS improves paper recycling! GEHMS improves paper recycling this week! 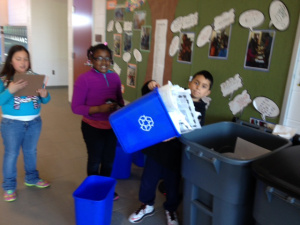 Last Monday marked the start of the third week of collecting recycled paper from all the classes on the second floor. During the first week, we collected 130 pounds of paper. In Week 2 we collected over 100 pounds more bringing our total to 250 pounds of paper. In Week 3, we collected over 200 pounds of paper. This week’s “Go Green” tip is: If you have an older brother, sister, or friend, have them give you their old sports equipment or clothes. This will allow you to reuse these items instead of throwing them away. For more tips and progress on our recycling drive, continue to check out the Recycle Kids Blog throughout the rest of the school year!